When you’re remodeling or building out a new kitchen or bathroom, the finishing details—like faucets—are the crown jewels that make your project stand out. From tile to accessories, you can find everything you need at International Bath & Tile. 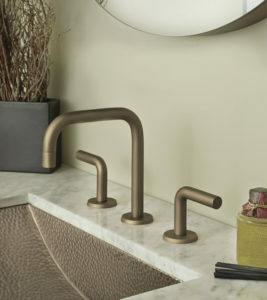 One of our favorite partners—California Faucets—has a unique range of faucets that will give your plumbing project the perfect finishing touch. In late August, California Faucets announced a new finish to their Gaviota faucet. Adding Matte Black to their range of finishes gives you the option of a contemporary urban chic look. 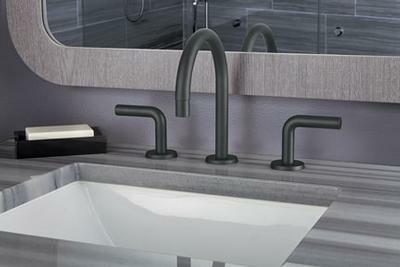 Another new addition to the brand’s black family of finishes is the Carbon (PVD) premium finish for kitchen faucets, which is a slightly lighter shade of black with the added durability that PVD offers. Matte Black and Carbon (PVD) are just two of more than 30 hand-applied finishes available from the brand’s full line of solid brass kitchen and bath faucets. Many of the finishes are available across several accessory lines, so you can complete your entire space and make a statement with a single color and texture scheme. While we praise the brand’s faucet product line, their products don’t stop there. You can also find shower sets, tub sets, luxury drains, bidets, and kitchen and bathroom accessories like soap dispensers, towel bars, and tumblers. So no matter what your project is, California Faucets has a product that will uniquely meet your needs and fit perfectly into the space you’re designing. With so many options through California Faucets, it can be overwhelming navigating your design choices. At IBT, our entire staff has years of experience and can help you decide the best faucet, finish, and accessories to make your project complete. While we can help you with your project from start to finish, here are some things to consider before choosing your faucet (and subsequent matching accessories). Think about what goes on in your sink. Do you fill large pots (and need a higher spout height)? Are you always cooking (and in need of a culinary faucet)? Do you have a dishwasher or will you be washing dishes in your sink? Consider the types of faucet handles. There are single, double, and hands-free faucets. Each type has its own pros and cons that might work better for your kitchen-lifestyle. Keep the rest of your kitchen in mind. If you’re not building a kitchen from the ground up or remodeling it, make sure the finish of your faucet matches the rest of your kitchen hardware. Take inventory on the accessories you already have. Will you be keeping an old sink (or tub, or shower) or upgrading to a new one? What does this faucet need to match? How do you want to control the temperature? Cross handles, joysticks, knobs, lever handles, and touch-activated faucets all offer different ways to control the heat and cool in your sink, shower, or tub. Explore your finish options. Different finishes can offer different looks to your space. Some finishes are less conspicuous when it comes to showing water spots and the like. These are all things to consider when choosing the finish for your faucets. When you’re looking for a faucet to complete your project, start with a visit to our San Diego or Solano Beach showrooms to check out our incredible collection of faucets. At IBT, we always have the latest and greatest from California Faucets and would be more than happy to help you choose a product to complement your project. Contact us by calling (858) 346-7455 to speak with one of our experts, or visit us online to schedule an appointment.